Mixing two shades of Colorsilk allows you to customize a hair color that flatters your skin tone and matches your personality without costing a fortune. Colorsilk is one of the least expensive home coloring brands, so mixing two shades still makes an economical choice. Combining two shades addresses annoying issues such as color that is too light, too dark, too golden or too ashy. Determine the color you want. Consider the undertones, like red, gold or ash, that you'd like to have in addition to the general color, like medium brown or dark blonde. Choose a dark brown with red undertones and mix it with a medium neutral brown shade to get an auburn cast without being too dramatic, for example. Mix similar colors for the most predictable results. Combine colors that are only a shade or two apart, like light and medium brown or dark brown and black. Consider the undertones. Cool and warm undertones balance each other. Neutral tones mellow the obvious red, gold or ash undertones without canceling them out. Mixing golden brown with ash brown, for example, results in a fairly neutral brown, while a golden brown and neutral brown mix still pulls slightly warm. Balance warm tones when going lighter by choosing a dye or dyes that have cool tones. Remember that when lifting hair color (going lighter), red and gold tones tend to become more pronounced. 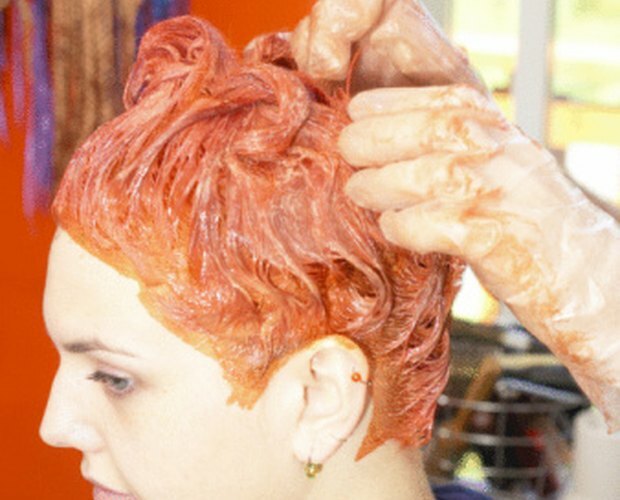 Adding more reddish or golden undertones could result in orange strands. Typically, the darker the hair, the more warm tones you'll find. Mix the dye according to the directions in the Colorsilk package, but instead of pouring one whole bottle into the developer, pour half of each color into a single developer bottle. Adjust your proportions accordingly if you want more light than dark, or more or less of a specific undertone. If you have thick or long hair, you may need the remaining hair dye. If you combined equal amounts of each color, simply repeat the steps of pouring the leftover hair color into the second bottle of developer to saturate all of your hair. You don't have to stick with the 50/50 ratio of colors if you'd prefer the dominance of one shade over the other. Try 2/3 of one bottle and 1/3 of the other, for example. If you do have long, thick hair, you may need to buy additional boxes of hair color if you don't use the 50/50 ratio. You will not be able to simply combine the remaining hair color into the second bottle of developer to get the same color as the first batch. Choosing a final color two shades away from your current color will result in a dramatic, but still natural, look. Sticking to just one shade away from your current color will enhance it without making a dramatic change. If you plan to mix two shades that are very different, call Revlon's customer service number listed on the box first. Do a strand test first to see how the colors look when they're combined.